Have you ever wanted to know more about the Royal National Park cabins? On the annual open day, hear directly from members of the shack communities for the National Trust Festival. You'll hear how the cabins have been built and maintained by generations of local families away from the mod cons of 21st century life. If you like a cuppa made the old fashioned way, it'll be made with tank water on a kerosene stove. Everything you see has been carried in by hand, meaning the shacks are an excellent preservation of early Australian holiday cabins, built prior to that area being incorporated into Royal National Park. Each of the four cabin communities take turns to host this annual heritage walk. This year's event will be peeking inside the cabins at Little Garie. The RNP Coastal Cabins Protection League hosts a free guided walking tour, meeting on Sunday 28 April 2019, run by volunteers from the community. Bookings are essential. The event is by donation but please note the standard Royal National Park entry fee of $12 per car applies. To book, call Kerry 0417 448 392 or email. Volunteer guides will take walkers to meet the locals and hear the stories of how the shacks came to be there and how these places have survived. Bring walking shoes, swimming gear, water and sunscreen. Be prepared to walk over rough bush track, uneven ground and sandy beaches. For more info, visit the Coastal Cabins website. See photos from inside the coastal cabins at Era and Garie, in Royal National Park. 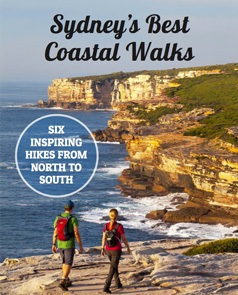 The Shackies of Royal National Park take the philosophy that Sydney’s best natural beauty can only be accessed on foot that one step further. Their simple beach cabins testify that limited access makes the best lifestyles! The annual open day is your chance to see this heritage-listed community for a glimpse of life away from the mod-cons of 21st Century life. Everything you see – from the 1950s kerosene stoves to the beer bottle walls (recycling at it’s best!) – has been carried in by hand. There’s no other way to access these cabins, built from the Depression-era prior to the land being part of Royal National Park. The communities were originally built on freehold land that was a grazing lease. It was incorporated into the National Park in 1953. As policies changed during the 1970s and 80s, the NPWS demolished more than 50 shacks. In 1993 the National Trust recognised the heritage value of the shacks and this stopped the demolitions. Years of community effort led to the retention of the remaining shacks and listing on the State Heritage Register in 2012. The NSW Heritage Festival is a chance for the Shackies to say thank you to the National Trust whose intervention with listing of the cabin communities was pivotal in their preservation. The open day is your opportunity to meet some of the people who have built and maintain the shacks. Families have worked over successive generations to preserve these increasingly rare examples of early Australian holiday national park cabins NSW. Apart from the open day, you can see the cabins year-round (from the outside only) by walking The Coast Track. Get a sneak peek inside the Royal National Park cabin communities at Era and Garie. The cabins are Stops 8 and 9 on the Coast Track Map. You can also see more heritage walking tours that feature as part of the NSW Heritage Festival in April-May each year. Many of these events are free or low-cost. Tagged Cabins, Royal Coast Track, Royal National Park.